You will earn 5,345 Reward Points. Earn 1 reward point for every 1 dollar spent. Traulsen’s G-Series "Dealer's Choice" models meet or exceed the standard specifications and performance of most other brands top tier product offerings. Reliable, energy efficient, and durable, with large individual storage capacities, the high quality G-Series hot food holding cabinet line-up includes a wide range of one and two section reach-in models, built in our most popular footprints. They are available with either full or half height doors, and the added convenience of a variety of different door hingings to choose from. 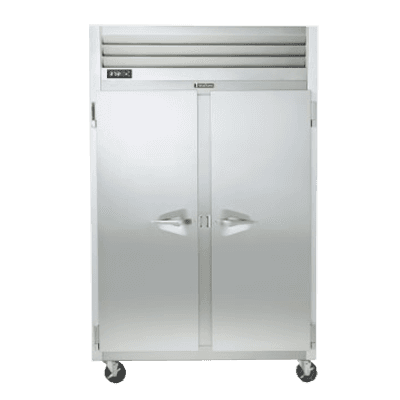 In addition, each also includes a number of user-friendly features, making them one of the best overall equipment values in Foodservice today, and the right fit for nearly any commercial application. Standard interior arrangements include three (3) plated wire shelves per section, mounted on pilasters, installed at the factory. Shelves are full-width, and do not have any large gaps between them requiring the use of "bridge" or "junior shelves." Recommended load limit per shelf should not exceed 225 lbs. A three year parts and labor warranty is provided standard.